I have been attempting to complete this story for over a year now. It has been difficult. I agree with Peta, this is a source of therapy. I thank SAKKS for being there for my family. I couldn’t imagine going through this alone, which somany of you have done for several years. 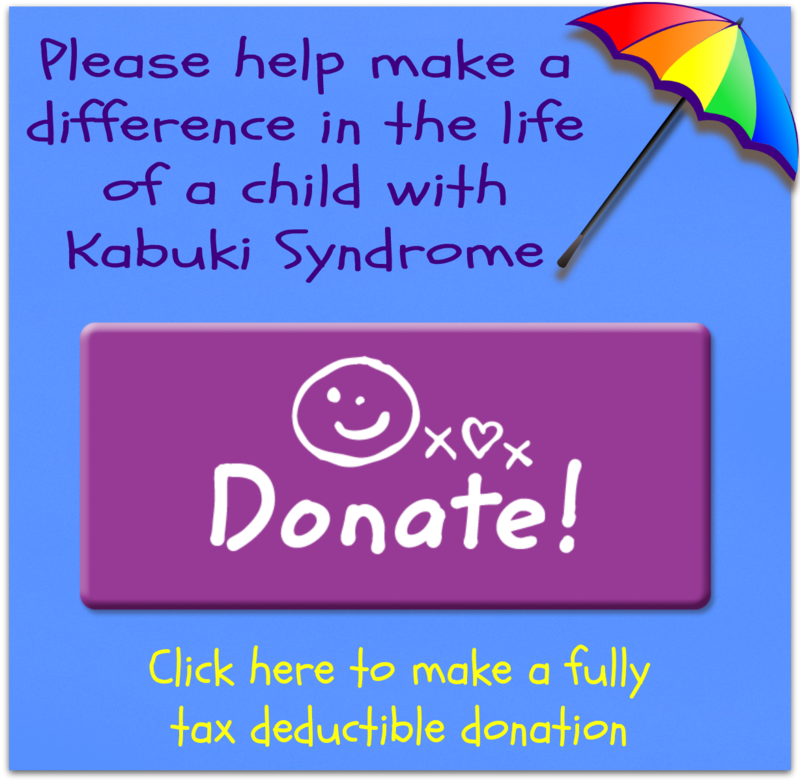 I feel a responsibility to get the word out about Kabuki Syndrome, educate the public and let families who are first learning of their diagnosis to not feel alone. I became pregnant in October 2006. This would be our third baby. I was extremely nauseas, much worse than the other pregnancies; I couldn’t even get into a car. Three weeks were spent sitting on the couch, trying to keep food down for the growing baby. Once I began to feel better, not normal but better I went back to my studies. The plan was to complete my math course and Anatomy before the baby arrived so I would stay on schedule for my ultimate goal, Registered Nurse. I have always wanted to deliver babies into the world and previously worked as a Medical Assistant. I went along and had the AFP test during my 19th week of pregnancy and went in for an ultrasound at 21 weeks. My husband and I would have liked a boy since we had two daughters already but it really didn’t matter. I could tell the baby was a girl and told my husband my thoughts, the technician agreed and a few moments later she stated she needed to get a doctor. I knew instantly there was something wrong, an actual doctor doesn’t participate in a regular ultrasound! I just started to cry. The doctor came in and informed us the baby had fluid around the left lung. This usually indicated a heart defect although the heart looked okay on ultrasound which could mean there was an underlying condition. He asked if I had my AFP test, which I had. The next hour he went to work to get the results immediately. These results are usually mailed at about 24 week’s gestation. The AFP was abnormal for SLOS syndrome which is a cholesterol deficiency with slight to severe mental challenges. Next are the amniocentesis and the fetal echocardiogram. Two weeks of just waiting. Going on your normal life, pretending everything was okay. I studied SLOS syndrome and was petrified inside. I didn’t want our daughter’s to sense my fear. Finally, we get the results. Everything was NORMAL. Wonderful, no more worries right? Wrong! Preterm labor was now striking at only 26 weeks along, while I was in Anatomy class dissecting a cow eye of all things. I went onto bed rest which wasn’t very easy with two other children and a husband who needed me. I was then put into the hospital for a bit over 2 weeks. They sure forced me to stay on bed rest. At this time I got two steroid shots to mature Sareena’s lungs “in case the labor couldn’t be stopped,” and continued on the Trebutaline. They also gave me antibiotics in case there was an infection, they weren’t picking up that it was causing the preterm labor. The blood cultures would take a couple weeks and it wasn’t worth the risk. It all seemed to work. I was sent home at 32 weeks. There was nothing else they could do to stop the labor. I lasted another week. My water broke, no going back. Nineteen hours later, Sareena was born. She was blue and didn’t look anything like our other girls. My first personal experience with NICU, I just couldn’t believe I was there. It must have been a bad dream. Her head was too small; her oxygen saturation was very low, along with the blood sugar. Then there was the IV’s, oxygen and feeding tube. There was also a sacral dimple with a patch of hair. Spina bifida was mentioned. Neuro Surgery appointments were made. I just kept thinking, how unfair it was to come into the world and get all this. I asked the doctor what was wrong and he couldn’t tell me. I asked if everything would be ok, if my baby would be “normal.” He responded, “Look at her, she is not normal,” and walked away. At that point I lost it. I felt an immediate responsibility to fight for Sareena. What was normal anyway? She was perfect, she was our special gift. She was transferred to Children’s Hospital where the care was amazing. This facility didn’t try to kick me out at night like the other hospital. My husband brought daily food and clothes. There was a shower and refrigerator in one of the lounges. I would sleep when the baby slept and the nurses would page me every time the baby woke up upon my request. They had the full breast pumps there and I would just pump away. It was the only real thing I could do for our baby. She was still having dusky spells when she ate but the doctors sent her home since we had CPR training. This made me very uneasy of course, but we went along with it. We waited until she was 6 months old to perform the MRI on her spine. The Neuro Surgeon said he would have the MRI done on the entire body since things were just a bit “off.” She was also seen by a Genetic Specialist, nothing was found. Sareena was behind in everything. Sitting, rolling, all those milestones were months late. The pediatrician of course wasn’t worried since she “was hitting them all, eventually.” I now wish I would have transferred doctors. She had asthma (which she grew out of at 1 year), Croup several times, pneumonia, and RSV twice, along withwaking up every 2 hours for a total of 2 years 8 months. I knew something wasn’t right. Finally getting to a new doctor, nothing changed. Her fingers looked different, her eyes, nose, and ears. I kept mentioning that she was waking up all night long. “You need to get her on a better schedule.” I had two other children; I understood what a schedule was. Then there is the constant diarrhea. Soy, made her constipated. She would go thru 20 diapers a day. When she did actually sleep, I still had to wake up constantly to change the diaper. Her bottom was just raw. I cried changing her diapers. It was so painful. The Gastro and Allergist couldn’t figure anything out either. She was behind a good 9­10 months developmentally and her tongue would stick out 24/7 regardless of sleeping. The diarrhea slowed down at about 2 ½ years. We kept changing the diet and finally a non­dairy approached worked without causing the severe constipation. Something was off, and doctors didn’t take me seriously. I saw so many doctors at this point. I thought I was going crazy. I must be wrong, nothing was abnormal and I needed to let it go. February 19, 2007. Sareena had her 10th bout of Croup. I was rocking her in the glider chair with the window open to allow the crisp night air to help the Croup. She had a fever and was given Motrin. As I was holding her I literally felt her little body boil. It made my hands hot. Her leg started to twitch. I ran down stairs with her yelling at my husband to call 911, “she is going to have a seizure I screamed.” Then it happened. Sareena’s entire body was shaking. I knew seizures themselves were not typically dangerous but she was vomiting. Her jaw was locked and I couldn’t clear her passage. As she got bluer and limp I just screamed “no, no, no.” At the top of the stairs I saw Breanna then 5, saying “my sister, what’s wrong with my sister.” The 911 operator is saying not to force the jaw open. I tried to get the jaw open anyway, but I couldn’t. I knew she needed to breath. Her precious little body was now cold. I stroked her hair and kissed her. I said that I loved her and thanked God for giving us this angel. The pain at that moment can not be put into words. I thought of all the families that lost children. I had said goodbye. The ambulance still wasn’t there. I look at my husband on the phone, crying asking the operator to send help, totally hopeless, his fingers were too large. At that point I figured, so what if I break her jaw, so what if the jaw locks on my finger. With all my strength I opened her jaw. I just knew the force I used had to break something. I began sweeping the vomit out. My finger was throbbing from the locked jaw but she actually took a deep breath! Minutes later the paramedics got there. We were now at the hospital. I could now breakdown. Remarkably her jaw wasn’t broken. She had another smaller seizure and was admitted to the hospital for observation. An EEG test was scheduled 2 weeks out to give the brain activity a rest before the test. When we did get this test, it was abnormal. The first talks of Epilepsy. Another EEG was done to confirm along with a Sleep Study. Another MRI was also done, it was awesome the first Neuro Surgeon included the brain because we had something to compare the recent MRI with. She had been waking up all night because she was having small seizures that interrupted her sleep. Sareena’s little brain was tired. She was put on Lamictal. The drug and side effects scare us, but the benefit is amazing. Go figure, the doctors are really listening now. They are calling me personally, asking questions, giving me their private numbers to call if I need “anything at all.” We saw another Genetic MD and that’s were Kabuki Syndrome comes in. Next is a Cardiology appointment; with another normal echocardiogram. An ultrasound was also normalchecking her kidneys. It appears Sareena had KS with the facial features, seizures and developmental delays. She is considered to be on the mild side. Now reading other KS stories, honestly I can’t complain. I did join SAKKS last year and sort of got involved but then pulled away. I lived in a world of denial. I give you all praise for your strength. We haven’t had to go through surgeries, I just couldn’t imagine. You are all heroes. Sareena started speech and occupational therapy within the school system. The results are amazing!!!! We have IEP meetings twice a year and she loves going to school like her big sisters. Seeing the improvement at starting this therapy at 3 years 4 months old, I could just imagine if we had an earlier diagnosis. That’s why I have signed on to be the West Coast USA Representative for the SAKKS organization. I encourage you all to tell your story. I would love to have the Regional Center recognize KS to get the help we need prior to becoming 3 years old when the school systems step in. The voice of KS needs to be heard. Although we have wonderful family and friends, whom I greatly appreciate, they don’t really understand this journey we have been placed on. SAKKS is our extended family. We look forward to expanding relationships with you all.